Gardner Island (since 1824) now Nikumaroro Atoll - This map shows the three mile distance between the competing theories. 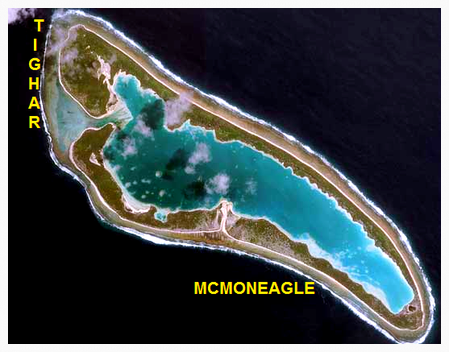 The theories are the Castaways vs. former Military Intelligence Operative McMoneagle's Ditching Theory. This 1:36 minute video will give you her around the world flight background. text. In 1932, she was the first woman to fly solo across the Atlantic Ocean. After setting dozens of aviation records, in 1937 she decided to be the first to circumnavigate the globe. But the day she took off to cross the South Pacific Ocean, she vanished. What happened has been the #1 aviation and woman's mystery ever since. And there are two theories as to what happened to her: the crashed theory and the Castaways theory.